Saturday’s ad is by the Brewing Industry Foundation, from 1945, part of a series of ads the beer industry undertook just as World War 2 was ending, after their “Morale is a Lot of Little Things” series. They were also a precursor to the “Home Life in America” series that was numbered (and which I’ve featured before), and very similar. Each ad featured an original illustration or work of art by prominent artists of the time, along with the first use of the “Beer Belongs…enjoy it!” tagline. It’s also when the UBIF started using “America’s Beverage of Moderation” in their advertising. 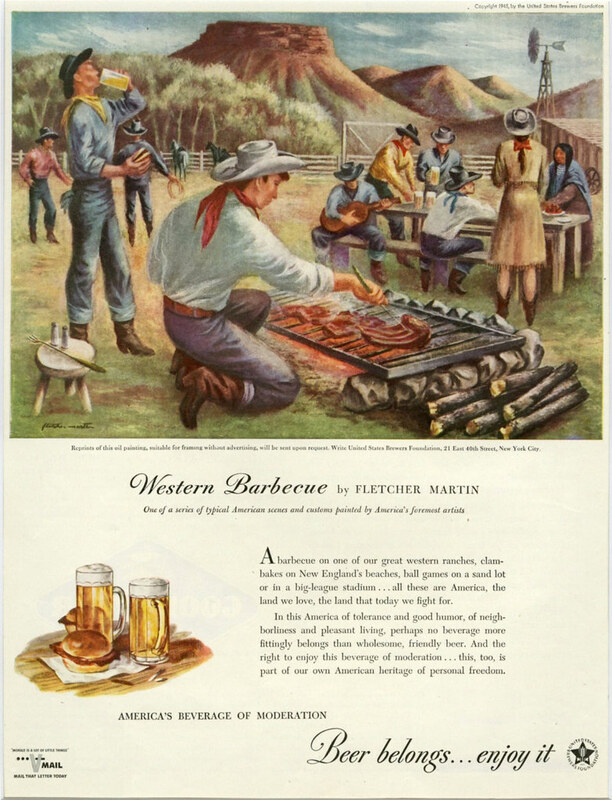 In this ad, entitled “Western Barbecue,” the scene shows a cowboy on a western ranch preparing for a barbecue meal, with cowboy and Native Americans waiting, or eating burgers and drinking beer. The painting was done by Fletcher Martin, who was an ” American painter, illustrator, muralist and educator best known for his images of soldier life during World War II and his sometimes brutal images of boxing and other sports” from Palisade, Colorado.